Frenchman Philippe Troussier is likely to take over as the coach of the Black Stars as his bid to land a similar position in Wales has been described this morning as “bound to fail”. A source within the Football Association of Wales (FAW), the football governing body, told GhanaHomePage (GHP) this morning that John Toschack is in pole position for the Welsh job. If this turns out to be true, Philippe Troussier will continue his talks with the Ghana Football Association after the FAW unveils its new coach to the press on Friday. Even though Welsh soccer bosses have thrown a veil of secrecy over their plans to find a new manager today, it has been revealed to GHP that interviews will be held in the outskirts of London this morning in a bid to avoid a media scrum in Cardiff, the Welsh capital. The number of managers to be interviewed for the job is down to three after former Liverpool coach Gerard Houllier pulled out. His withdrawal leaves John Toshack and Dean Saunders, and Philippe Troussier on the FAW's short-list. But it seems inconceivable that the FAW could choose anyone other than Toshack according to the GHP source who has pleaded anonymity. 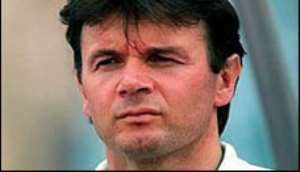 The road to the 2006 World Cup would be easier for Troussier as the coach of the Black Stars than the manager of Wales. With two points from four games under former coach Mark Hughes, Wales have slipped to second bottom behind England, Poland, Austria and Northern Ireland. Only Azerbaijan have a poorer record in the group. Ghana, however, is placed second just a point behind group leaders South Africa.